This post is cross-posted at the NRDC Switchboard. As California continues to face severe drought conditions, a new report released today by NRDC and the Pacific Institute tallies the huge potential to lower water use in virtually every community across the Golden State. Reducing water demand can help make our cities more resilient to future droughts, saves energy and reduces air pollution, and leaves more water in rivers and estuaries for fish, wildlife, and recreation. Compared with the water consumption levels of the last decade, urban water use can be cut by one-third to one-half using technologies and practices that are available today. We helped develop these estimates, and summarize the most significant of them here. Urban water use, or the water we use in our cities and suburbs, accounted for one-fifth of California freshwater withdrawals in the last decade, with the other four-fifths going to irrigate farmland. Between 2001 and 2010, the state’s urban water use averaged 9.1 million acre-feet per year, equivalent to 230 gallons per capita per day. Residential use is the largest category of urban water use, two-thirds of which is used in and around our homes. The next largest category of water use is frequently referred to as CII, an acronym for commercial, institutional, and industrial. Institutions (such as schools, prisons, and hospitals) and businesses (such as hotels, restaurants, and office buildings) account for about 23 percent of California’s urban water use. Only about 6 percent is used by industry to manufacture a wide range of products, from chemicals and electronics to food and beverages. About half of California’s urban water use is outdoors, largely for watering landscapes, but also for such uses as washing cars or sidewalks, and filling pools or spas. Recently, we analyzed the potential to reduce urban water use through a variety of conservation and efficiency programs. Californians have a long history of reducing water waste. Californians have come together to conserve during previous droughts, and Californian inventors have developed water-efficient technologies that are used around the world. However, there is still a great deal of untapped potential to save water. Our analysis focused on the savings that could be achieved through more widespread adoption of technology and practices that are available and already in use in California and elsewhere around the world. For example, we estimated how much households could save by replacing some of their lawn with low-water landscaping, or by installing water-efficient appliances and fixtures, such as Water Sense-labeled toilets and showerheads, and Energy Star clothes washers. Based on our analysis, we found that businesses and industry can improve their water-use efficiency by 30 to 60 percent by adopting proven water-efficient technologies and practices. Residents can improve their home water efficiency by 40 to 60 percent by repairing leaks, installing the most efficient appliances and fixtures, and by replacing lawns and other water-intensive landscaping with plants requiring less water. In addition, water utilities can expand their efforts to identify and cut leaks and losses in underground pipes and other components of their distribution systems. Together, these measures could reduce urban water use by 2.9 million to 5.2 million acre-feet per year. Identifying the technical potential to improve water-use efficiency is just the first step in tackling water waste. What will it take to tap into these savings? One obvious answer is money – it takes money to save water. But water efficiency projects and programs tend to be less costly than building new infrastructure to increase water supplies. 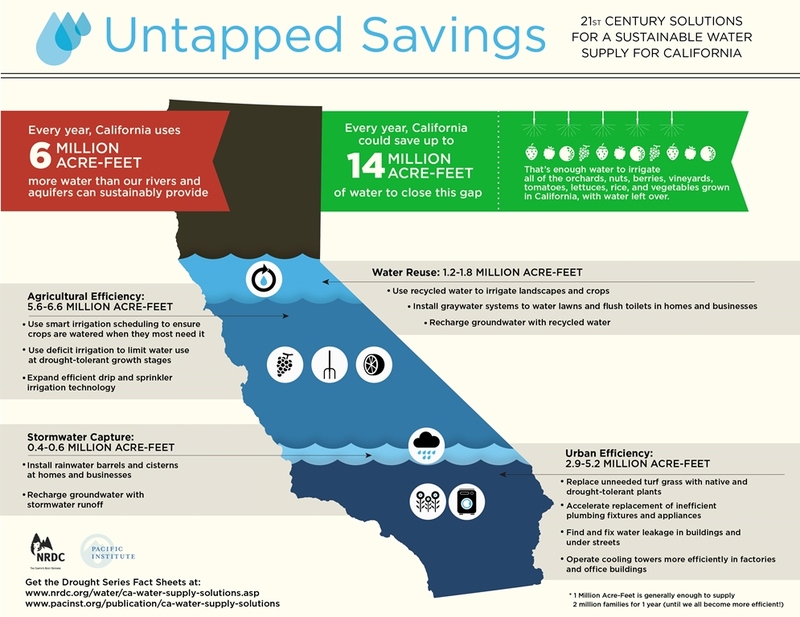 For many California communities, it is a wise investment to expand their water efficiency programs. More importantly, we need better execution of policies and practices that we already know will work. We already have laws on the books requiring water meters and volume-based billing for water service, but more than a 100,000 connections remain unmetered, and few if any apartment dwellers ever see a water or sewer bill. We already have laws requiring more efficient plumbing products and replacement of inefficient fixtures, yet millions of water-wasting fixtures remain is use. Pool covers, drip irrigation, and Energy Star clothes washers all save water, but their deployment is nowhere near universal. Customer rebates can help, and current programs are being expanded across much of California. But better pricing structures for urban water and sewer service also have a role to play. Water customers respond to price signals, and obsolete pricing structures can slow down progress toward greater water efficiency, especially for water use outdoors. Progressive water rate structures can keep water affordable for everyone’s basic needs, while targeting waste and charging proportionately more for discretionary water uses such as pools or large landscapes. For example, tiered and seasonal rates help ensure that high-usage customers pay their fair share of the costs they impose on water systems to meet summertime peak demand. A substantial body of law and policy already points the way to a more sustainable water future for our state. The California Constitution itself prohibits the waste of water, and numerous state statutes, regulations, plans, and guidance documents identify the measures and practices that are available to make Californian’s water use more sustainable, and ensure that adequate flows are available to support vibrant ecosystems and a healthy economy. Many innovative policymakers around the state have proposed new approaches to promote more widespread implementation of these strategies. We look forward to working with them to follow up with more specific actions for bringing the supply and demand for water in California into a sustainable balance. These estimates are contained in a new report released by the Pacific Institute and the Natural Resources Defense Council. What I don’t understand is why is the drought being put upon citizens of the state. Go to the central Valley, why are there so many new communities being built, not only that, being built with grass front yards and large tubs in bathrooms. Why are the politicians allowing farmers to farm products Californians as a whole don’t eat. Why is Fresno continuing to build huge home with 4and 5 bathrooms. People can literally live on a liter of drinking water a day, and a bucket of clean water to bath in a day. People can conserve all day. My Dad has been making us conserve water sense we were 2 years old. I took showers with my two brothers, we got in, wet up, lather the rags, turn off the water, lather up. Turn back on the water to wash off, get out, 5mins. Meanwhile through it all, my people in the ghettos across the west, and white folks the same, to simply save money has been doing the same thing. 2015, and for 35 years it has only got worse. You know why, because while the poor and disenfranchised keep following lame politics, the rich and privilege continue to consume the resources at a high rate hoping for replenishment. Mexicans farm these lands we so call say are at fear of losing, yet and still I haven’t seen a single Ceaser Chávez come forward and ask for help so he can get out there and continue to pick crops. You know why, because its not about my Mexican comrades, its about the people getting rich on their slaving these farms. Move the agriculture, move the water soaking businesses like Arrowhead water company, tackle the real problems, and leave the everyday working man alone about this drought. I am so sick and tired of the dodging of the real problem existing today. Rise up, demand freedom of the press, and freedom from unnecessary persecution. Black, whites, Hispanic, other, we all in this together vs money and lobbyists of California.